It’s a question we hear often: How would Tronc pay for the raises and improved benefits we’ll pursue through our union? Well, the answer is that a great deal of money continues to flow into The Times, because of the high-quality journalism our newsroom produces every day. At a recent all-hands meeting, Ross Levinsohn said Tronc still earns $1.5 billion in annual revenue and remains profitable. 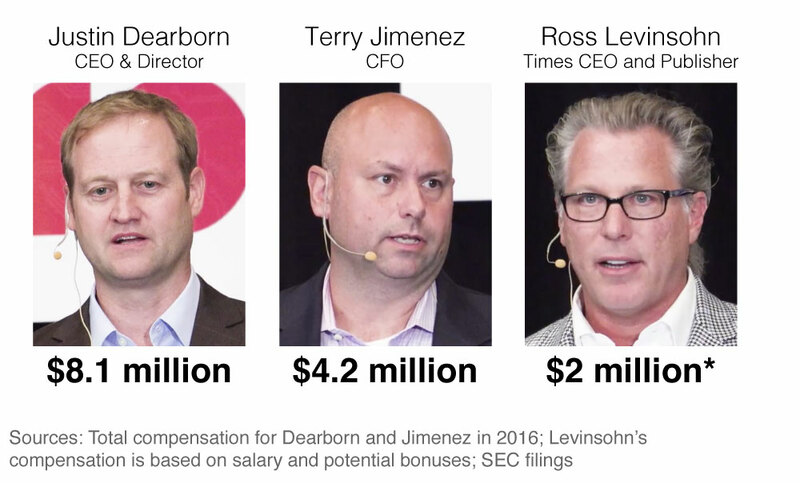 The problem is that a disproportionate amount of those profits are lavished on the salaries and perks for Levinsohn and a handful of other richly compensated Tronc executives. The Columbia Journalism Review noted Monday that executive compensation at Tronc shot up 80% last year — a nearly $9 million jump over 2015. That squares with the findings below from a NewsGuild analysis of Tronc’s SEC filings. Michael Ferro’s private jet alone costs the company millions. From February 2016 through September of this year, Tronc spent $4.6 million to sublease and operate the sleek Bombardier aircraft, which costs $8,500 an hour to fly. The kicker? Tronc subleases the jet from Merrick Ventures, one of Ferro’s companies. Last year, Tronc CEO Justin Dearborn made an eye-popping $8.1 million in total compensation. He made substantially more than his counterparts at The New York Times Co., Gannett Corp., Dow Jones/Wall Street Journal and McClatchy, among others. In fact, Dearborn’s compensation was $3 million more than that of New York Times CEO Mark Thompson, whose company has revenues similar to ours but a market value many multiples of Tronc’s. Plus, Thompson took a pay cut in 2016 because he did not meet his performance goals. There is no word if any of the journalists who actually produce that content will get a cut. Levinsohn’s three-year contract is worth a total of more than $13 million based on last Friday’s stock price. Meanwhile, Tronc is adding more big-dollar executives to the corporate hierarchy -- even as key newsroom openings go unfilled, forcing already overworked staffers to put in longer hours for no extra pay. Tronc spent nearly $250,000 to buy sports tickets from Ferro's company. And it has spent handsomely on golden parachutes. Ex-CEO Jack Griffin, for example, got a $2 million send-off when he was canned — after just two years on the job. If executives were paid more in line with their industry peers, the savings alone would finance thousands of dollars in annual raises, lower out-of pocket healthcare costs, accrued vacation (that was taken away unilaterally), and perhaps even lower parking fees. In fact, if Dearborn last year had made the same as his New York Times counterpart – a “mere” $5 million – the $3 million in savings could provide a raise of about $8,000 to everyone in our Guild bargaining unit. It is not an unreasonable request. Los Angeles Times employees have gone many years without even a modest cost-of-living raise even as Tronc and The Times have been profitable. What we would like to see is a more equitable distribution of money and perks between the executive suites and our journalists, whose talent and hard work pay The Times’ bills and deliver lasting returns to our shareholders. Newsroom managers have been ordered to tell employees that there is a “finite” amount of money to spend on a union contract, so that a raise for some could mean cuts for others. First things first: We would never agree to cut an editorial worker's pay to lift another's. Secondly, any union contract we negotiate will ultimately be voted on by you. Voting yes for the union and establishing our own NewsGuild chapter means that we’ll have a legally guaranteed voice in addressing the issues that affect our pay, benefits and working conditions. A healthy financial future for The Times depends on our ability to give subscribers the kind of journalism they can’t get anywhere else. We should be compensated in a way that reflects and rewards our make-or-break role in this enterprise. Older PostWe have a new printable sign for supporters.